Know what gets green tree frogs in the mood for love? Rain. 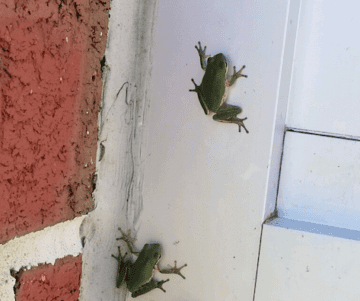 Not long after Hurricane Florence, tiny frogs seemed to invade the Outer Banks, popping up on porches, in yards, on cars, in mailboxes, on screen doors – you name it. The little guys, described in local social media groups as “adorable but slightly concerning,” have their fans and foes. “They poop everywhere!” said one. “I love them!” said another. While the green chirpers showed up not long after Florence, the baby boom is more likely the result of late July’s double-digit inches of rain. Tree frogs breed in ditches, puddles or any bit of water they can find, said biologist Jeff Hall, an expert on amphibians with the North Carolina Wildlife Commission. When there’s a significant rain event, it’s not at all unusual to see tiny frogs, lots of them, a month or two later. Hall said if you see a large congregation, they’re probably attracted to a light source, because that’s where the bugs are. So love them or hate them, the recent tree frog invasion could be helpful with eastern North Carolina’s other fall explosion: mosquitoes. How long will our green visitors hang around? Many toads and frogs will live three to five years, Hall said, but may go into a type of hibernation in winter, laying low under logs and in other hiding places that won’t freeze. There everywhere they showed up after the 15 inches of rain. They’re all over my windows and hot tub. I had one jump on my face laying in bed. And I had another in the kitchen on the cutting board. There everywhere!!! Left Harris Teeter week ago Thursday after street lights had come on and my car was covered with them. I’d been plagued with them at home, in not being able to bring packages in without bringing in at least one of them, for the cat to chase all over the house, but I have lots of green stuff around the house. Was not expecting to see them in a barren parking lot. Cat discovered one this morning climbing up the outside of my kitchen storm door. Could not figure out what she was staring out, just wasn’t looking outside the kitchen.